Deposit: $2000 due to reserve a space on the photo tour (leaving a balance of $7600 due thirty days before the tour). The photo tour fee includes everything once we leave Fairbanks including flight to Kaktovik, food, lodging, in-field guiding, instruction, ground transportation, gas. This epic arctic photography adventure will begin in Fairbanks, Alaska. We will fly as a group to a small native village on the edge of the Arctic Ocean. 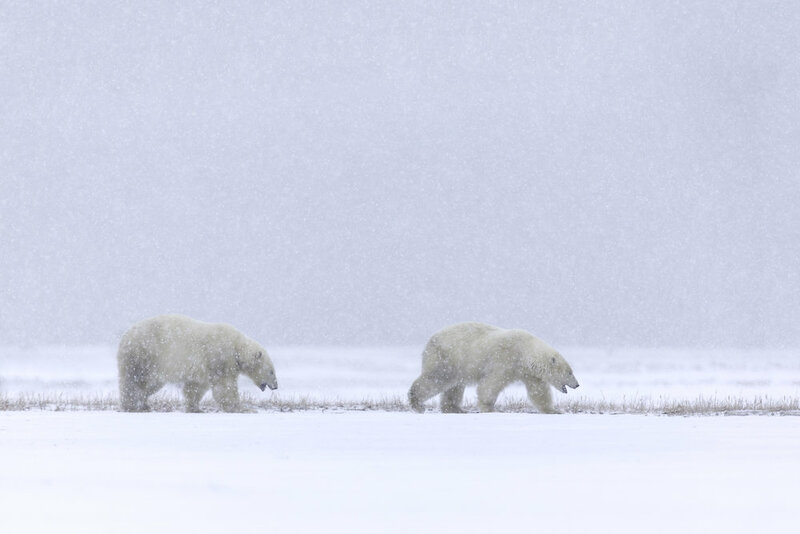 Once there, we will photograph Polar Bears by boat. The bears are very reliable in the harbor just outside town. Most days 15 - 30 individual bears rest and play at eye level. The boat will have a heated cabin, and a captain that I have worked with for the last five years and really enjoy working with. On the fifth day of the trip we will fly back to Fairbanks to begin the second leg of this spectacular trip. From Fairbanks we will start exploring the northern boreal forest in search of Moose, Spruce Grouse, Sharp-tailed Grouse, Northern Hawk Owls, and mountain scenery. Next we will head north once again crossing the arctic circle (but this time by van) to the edge of the treeline where we stay in a beautiful bed and breakfast located at one of the most ideal places to photograph northern lights in the world. Proceeding further north, our group will cross the Brooks Range mountains with Arctic National Wildlife Refuge on the right side of the road, Gates of the Arctic National Park on the left. In the mountain pass itself we should be able to find Dall Sheep, Caribou, Willow Ptarmigan, and Gyr Falcons. The Brooks Range mountains themselves have a stunning and stark beauty. As they taper off, we enter the North Slope, where endless tundra provides habitat for Red and Arctic Fox, large Caribou Herds, and Musk Ox. Each night, whoever wishes can join me for photographing Northern Lights on the nights with clear skies. 1. My trip is longer and has more photo time. 2. My trip takes you to the best place in Alaska for northern lights. The couple other similar trips might claim that northern lights are possible, but in reality, at their latitude position, they are far out of typical ideal range, and the lights will be low on the horizon if they see them at all. 3. I use the most reliable boat captain in Kaktovik. He is properly licensed by ANWR and the coast guard. Not all are. 4. My Dalton leg of the trip, while not only getting us in ideal position for Northern Lights, also allows me to use my extensive knowledge of birds and wildlife to help us photograph owls, grouse, caribou, musk ox, and more. On this portion of the trip, I use a vehicle specially outfitted for this road, and I have booked a year in advance to assure our group has the only comfortable accommodations in the Brooks Range. Equipment: I recommend bringing a digital SLR with matching lens. On this photo tour, we will want a wide variety of lenses. A long lens will be useful for mammals that keep their distance or for frame-filling portraits. At times the animals travel through scenery that is so beautiful, it begs to be included in the frame, so a mid-range lens will be useful. I found my 70-200mm to be perfect. We also will have opportunities for amazing landscapes and northern lights, so bring a wide angle as well. Bring a tripod, and bring binoculars if desired. October 7 - Pre-trip. Arrive in Fairbanks no later than the evening before the trip. Meet for optional meet and greet dinner. October 8 - Fly to Barter Island, Alaska. 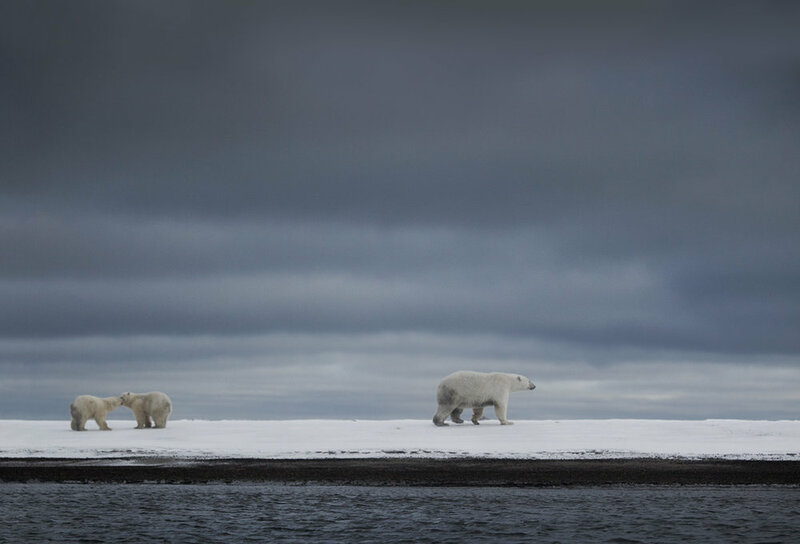 Photograph Polar Bears by boat after checking into the lodging in the afternoon. October 9 - Polar Bear photography all day. 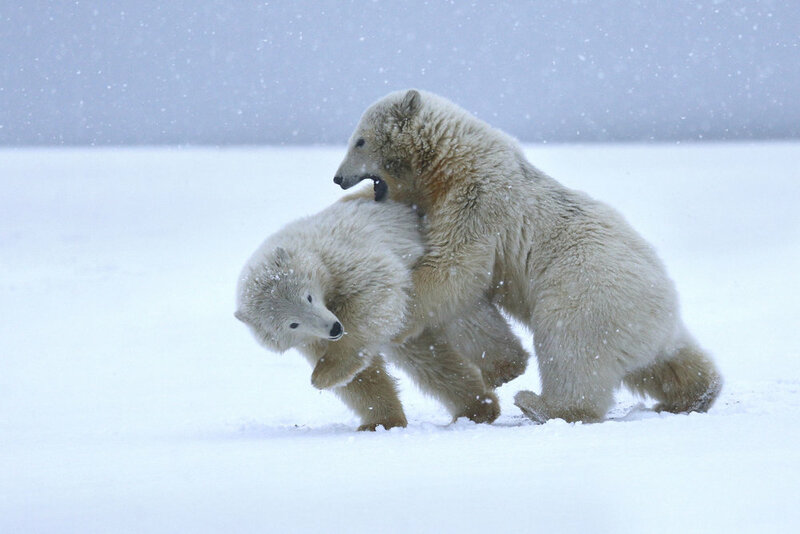 October 10 - Polar Bear photography all day. October 11 - Polar Bear photography all day. October 13 - Drive from Fairbanks to Wiseman, passing back through boreal forest looking for Spruce Grouse, Sharp-tailed Grouse, Hawk Owls, bears, moose, and landscapes, and the Aurora Borealis at night. October 14 - Explore the Brooks Range from Wiseman, looking for Caribou, Dall Sheep, Ptarmigan, Red Fox, Gyrfalcon, and the Aurora Borealis at night. October 15 - Drive up to Deadhorse. Stay in Deadhorse in a humble hotel for the night. Look for Musk Ox, Caribou, and Arctic Fox. Aurora Borealis at night if the opportunity presents itself. · Clothing: My Mom says, "there is no such thing as weather that's too cold, there is only 'underdressed'." With that in mind, I would rather you bring too many layers than not enough. In my experience, quality winter clothes make a big difference. While a nylon fill coat from Walmart might look almost the same as a 850fill down coat from REI, when you are on the bow of a boat on the arctic ocean, I assure you, they don't feel the same . . . I have learned this through experience. If you don't already own basic cold weather clothes, I recommend going to your local outfitter and talking to their staff and trying some things on. · Boots: Warm winter boots and comfortable warm socks. Sometimes I layer a thin sock under a thicker hiking sock. We may wander off the road several hundred feet once in a while in snow up to a foot deep. That would be unusual but I don't want you wearing sneakers. · Jacket: You will want a warm coat. Be prepared for temperatures from zero the lower 40's, with a moderate wind at times. Previous participants said they were happiest with a down jacket and a windbreaker or shell on top of that. · Hat and Gloves: I recommend wearing a ski mask to keep your face warm if it is windy. A warm hood or beanie could be nice as well. Wear the warmest gloves possible but make sure you can still operate your camera gear with your gloves on. · Warm Pants: Layering is essential especially when we photograph northern lights in the Brooks Range. Wear long underwear or a warm cotton under layer. You can wear regular pants over that, and then I recommend something to block the wind on top, possibly with some insulation. · Bag Blind or Camo. No need to bring any. Cell Phones and Internet: We will have fast wifi in Fairbanks, and no internet in the Brooks Range except it may be available for a small fee from a diner we will use for many meals. We may only have phone reception around Fairbanks and Deadhorse. The sun will rise and set around 7:30am and set at 7:30pm. Most days it will be common to wake up with temperatures in the mid 20's. Some afternoons we could see temperatures in the lower forties near Fairbanks. In the Brooks Range at night (while photographing Northern Lights) it would be typical to see temperatures around 15 degrees, but I have seen it as low as 5. We will use as much photographable light as we can each day, shooting sunrise through to sunset with a lunch break in between. On the bear boat, sessions normally run 8am - 11am, then 3:00pm - 6:00pm, but can vary depending on the forecast. The bears tend to pick a spot and stay with it for many hours, so variety tends to be achieved more by the number of shooting sessions rather than the length of the sessions themselves. The bears primarily move around at dusk and dawn, and kind of just nap through most of mid-day. Transportation: There will be a lot of driving during this trip in order to gain access to a variety of habitats. On the final day of the trip we will drive about 240 miles, but depending on the road conditions and how often we stop, we will likely be in the vehicle for the better part of 12 hours. I will rent a boat and a vehicle for the group while in the Arctic National Wildlife Refuge. This is included in the cost of the trip, as is the flight from Fairbanks to Kaktovik and back. More information to be provided about where to stay upon signing up for the trip. Fairbanks hotel costs are not included in the photo tour fee. All lodging north of Fairbanks IS included in the photo tour fee. Four nights will be booked as double occupancy. If you want single occupancy, it may be available upon request for an additional charge. Meals: Meals will be included in the trip cost in all locations except Fairbanks. On the first day, and during a couple mid-day breaks I will go over some tips, composition, and post processing ideas. My clients on this trip are usually very experienced photographers though, and unless you tell me otherwise, I am presuming that everyone is taking this trip more to maximize productivity than to learn how to use their gear. Along with a few brief slideshows and discussions. I will try to talk about my photographic vision for each situation and spout off my camera settings in the field as well as peek over everyone's shoulder from time to time to check histograms and exposures. Aside from that, I'll need YOU to tell me if you have additional questions, learning objectives, or concerns. I think all of you know your way around your camera fairly well but please don't hesitate to let me know if you have questions. If I don't know the answer, I'll do my best to find out. Almost all the photography on this trip will be done right from a boat or from the road next to our vehicle. If for some reason we can't find Caribou or Musk Ox right next to the road, I will hike up to a half mile into the tundra with whoever wishes to join me, but this probably will not be necessary. There may be a high step into the boat. I want everyone to walk away with a beautiful portfolio of Alaska mammals at the beginning of the winter snow fall. We will try for everything from action shots, to tight portraits, to wildlife-scapes showing the context of the landscape with the animals. Northern Lights will be a big priority as well at night.